Last week I told you about my favorite Thanksgiving fonts and even shared some free printables I made with them. I know Thanksgiving hasn't passed, but I thought some might be taking advantage of the holiday weekend to get some work done towards Christmas. I thought I would share some of my favorite Christmas fonts with you (and I do know some of these were in my Thanksgiving list, I really love them!). I hope you find my list helpful! What is your favorite font for Christmas? 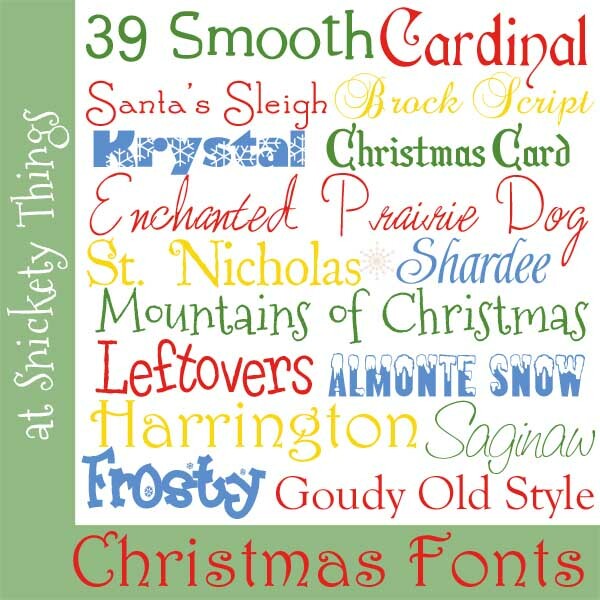 For more Christmas fonts go here. I'm quickly getting addicted to downloading fonts. It's so much fun to find a new one! Thanks for sharing your list! I am very addicted to fonts. I'm glad you found these helpful! Thanks so much for the great list of fun fonts! I'm a total addict and found a few new ones. I'm glad you were able to find some new ones. Thanks for stopping by! super fun, thanks for sharing! !